When it comes to smart watches Mobvoi is a Chinese manufacturer that may not be synonymous to the big names such as Apple and Samsung, but the company in a stealth fashion have garnished a lot of attention from folks like myself to point of me wanting to purchase their smart watches, the Ticwatch S and Ticwatch E. Interestingly enough, the Mobvoi is part own by Google which is probably why their smartwatches is implemented with Android wear 2.0 OS. The wearables itself is a Kickstarter funded campaign that have raised to date a whopping $3 million dollars. Both the Ticwatch S and E are on par with each other when it comes down to specs, with the S slightly having more features and a different structural design. On my arm right now is the Ticwatch E and I have an honest straightforward opinion about my latest wearable. So sit back, relax, and read my latest review. The Ticwatch E ( express) have a simplistic minimalist circular design, which for me less is better when it comes to any tech gadget, in particularly wearable's. The overall weight is light, seriously, its as if the smartwatch is not even on my arm, it doesn't have the feeling its cutting off circulation to my arm like some smartwatches I’ve purchased in the past. 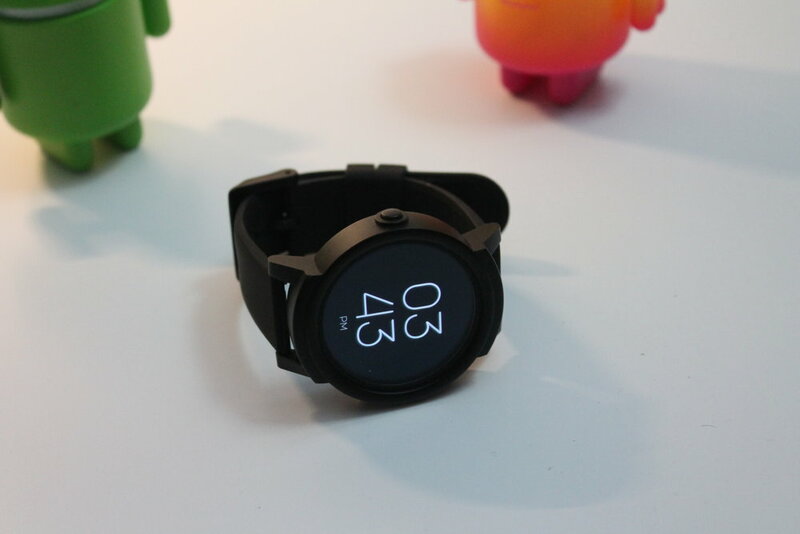 The Ticwatch E construct is made out of plastic which is probably why it feels so light. The smartwatches bezel is very small, but its probably the intent of the manufacturer to highlight the watches face. When it comes to watch band, it's made from silicone rubber which for me is a bit bland, then again maybe it's me being a bit picky, as if a watch band on any gadget wearable are an eventual deal breaker. Nevertheless, if you're picky like me when it comes to smartwatches, in particularly watch bands, good news, the band can easily be removed and swapped for something more stylish and fashionable. Overall, the design of the Ticwatch is certainly not on the level of Huawei, Fossil, or even the Apple watch, but the black charcoal color scheme does add sleekness to the smartwatch. Probably the biggest wildcard on the Ticwatch E is the display, honestly, being price friendly and all I expected the display to be unappealing but its the complete opposite. It's 1.4-inch display is vibrantly colorful thanks in part to a 400 x 400 resolution and OLED technology. If you’re going to produce a smartwatch that’s going to take on the established brands, then you better implement a quality display. The display itself is sunken which should thwart users from scratching the watch face even though its suppose to be already scratch resistant. And if you so desire to shower while the Ticwatch E is still on your wrist, then you're in luck, the display is IP67 certifiably protected. The Ticwatch is probably the only Android Wear 2.0 smartwatch that it is powered by a MTK MT2601 processor which is Dual-Core and surprisingly have a fast clock speed that comes in at 1.2GHz. When it comes to memory and storage, the Ticwatch E falls a bit below their market counterparts having 4 GB of RAM and have a 512MB ROM. The fluid performance I've experience thus far since the smartwatch has dawned my wrist is more than likely attributed to the processor. What’s a smartwatch without sensors, which the Ticwatch have, several in fact, a heart rate monitor for those who have cardiovascular concerns. There's also a proximity sensor, an accelerometer gyroscope, E-Compass, GLONASS, and GPS. 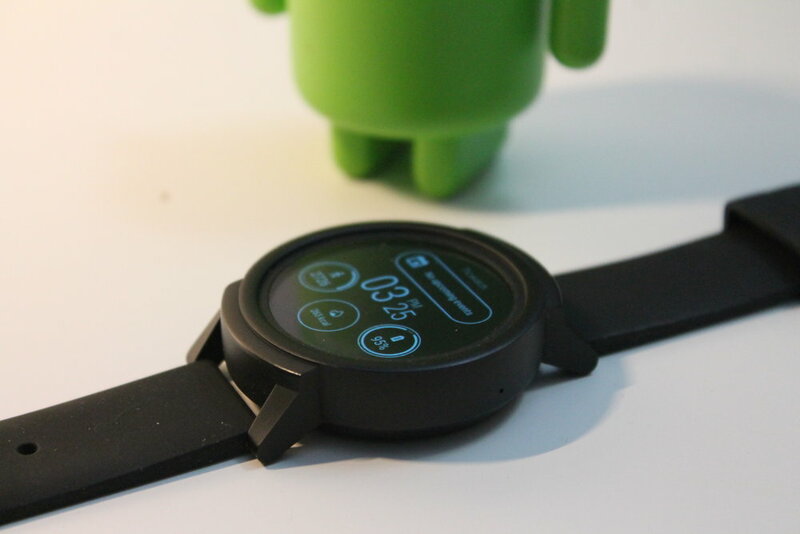 Then there's the battery life, Mobovi said its 300mAh battery within their smartwatch can grant users 2 full days of usage, but there is some things you must to take into consideration, like the always on display, GPS usage, fitness tracking and notification updates and so on. If you were to turn off notification updates or even set the smartwatch to sleep mode then it's quite possible to squeeze out 48 hours of battery power. In my test I was able to get at least a full day of battery power, that’s mainly due to me exhausting most of the smartwatches features. Now there are some reports that many users are experiencing a rapid drops in battery power, which didn’t happen to me thus far. Fully aware of these incidents, Mobovi stated that users should let the battery completely drain then recharge, doing this should remedy that rapid depletion of battery power. One things for sure, the Ticwatch surprisingly charges fast. From a low powered state at 15% it actually take 30 mins to bring it back up to full charge. Whats even more impressive is there is no wireless charging, instead the Ticwatch uses a magnetic charging cable. You know the old saying, “you get what pay for”, being that the Ticwatch is priced so reasonable it’s expected to minus some key features that's seen on most smartwatches on the market. Gone on the Ticwatch is cellular connection and the ever so useful NFC chip. 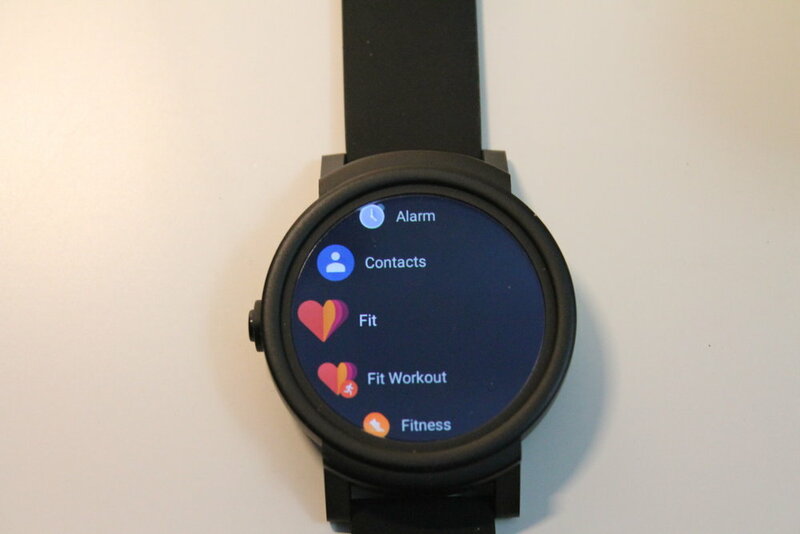 Other than that, the TicWatch does have your standardized smartwatch features such as the heart rate monitor, fitness tracking and notification updates. Like the big boys in Samsung and Apple, the Ticwatch does grant users with the ability to make and take phone calls which means yes, there is a built in mic and speaker present. 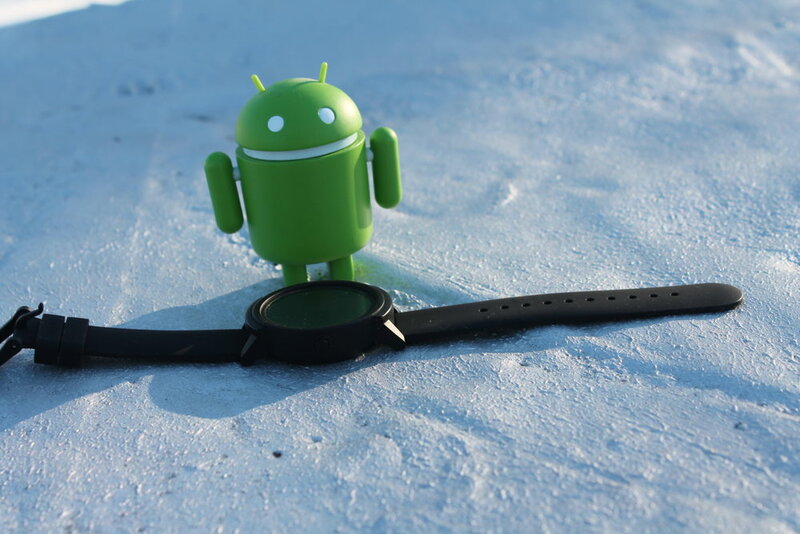 Being that the Ticwatch E is Android Wear 2.0, you're connected to the Google ecosystem which includes Google Assistant, the Play Store, Google Translate and much more. Navigating through apps is made possible via touchscreen, there is no scroll dial or a rotating bezel which for me I prefer the latter as it is the best feature on my Samsung Gear smartwatch. When it comes to performance as I stated earlier in this post, the Ticwatch behaves fluidly, not something I was expecting from a price friendly smartwatch. I experienced no type of stutter or app lag when engaging with the interface. For me though, what defines a smartwatch in terms of performance is how well its interacts with your smartphone via Bluetooth connection. Speaking of which, amazingly, I'm able to maintain connection with the smartphone in upwards to about 30 feet without losing any signal. If there’s one big gripe with the performance with the Ticwatch E I would say sometimes the fitness and heart rate apps are a bit unresponsive, often times when checking my heart rate I have to wait a long time before getting a reading (I counted a 5 min wait time), then there are times the response is rather rapid. And as far as the fitness tracking goes, for me it does not even come close to the likes of the Apple watch or even the Samsung Gear. Still despite some of its flaws, I’m rather satisfied with the Ticwatch overall performance. I can seamlessly control music streaming such as Spotify, Soundcloud,etc. My entire phone contacts actually appear on my watch, which again, that's due in part to both the smartphone and smartwatch being part of Google-Android ecosystem. It's worth mentioning that the actual retail price of the Ticwatch E is $159 dollars, I was able purchase it at an even lower price at $129 from Amazon. In comparison to what's on the market, the smartwatch I would say is a budget oriented wearable that may have many thinking the low price equates to low performance which is not the case. Now the Ticwatch E does have some noted issues, fitness tracking and heart rate monitoring apps certainly doesn't best what Apple and or even Samsung have to offer on their smart watches. And design quality is a tad bit well plasticky, yet the thin bezel around the display and matte black color scheme makes up for it adding sleekness to the smartwatch. That display though, yes that display is what won me over, colorfully bright and crisp as I would like to describe it in short. The sync ability between the smartphone and Ticwatch is flawless as it should be since both uses Bluetooth 2.0. The NFC is certainly missed, a useful feature I enjoy so much when I'm wearing my Samsung Gear. All and all, if you're in search of a smartwatch that won't break budget, and let's face it, some smartwatches can be a bit pricey, the Ticwatch is must have gadget.